Indiana Oaks (Grade II) runner-up Figarella’s Queen leads a competitive field of 11 3-year-old fillies that were entered in Saturday’s 43rd running of the $100,000 Dogwood Stakes (Listed) at Churchill Downs. The seven-furlong Dogwood is carded as Race 10 on Saturday’s 11-race program with a post time of 5:26 p.m. (all times Eastern). The first race gets underway at 12:45 p.m. Owned by Qatar Racing, Hunter Valley Farm and Marc Detampel and trained by Brad Cox, Figarella’s Queen (8-3-2-1—$200,215) finished second behind the talented Talk Veuve to Me in the July 14 Indiana Oaks. The daughter of Medaglia d’Oro then tried the 1 ¼-mile Alabama (GI) at Saratoga but was eased at the top of the stretch. A $250,000 Keeneland September Yearling Sale purchase in 2016, Figarella’s Queen was a two-time winner over the turf in South Florida at Gulfstream Park with trainer Gustavo Delgado prior to shipping to Cox’s barn in April. Jockey Shaun Bridgmohan, who was aboard Figarella’s Queen for her one-length allowance victory three starts ago when she switched surfaces to the dirt, has the return call Saturday. She’ll break from the rail as she cuts back in distance. Cox is seeking his second Dogwood victory – he won last year’s renewal with Pinch Hit – and Bridgmohan is looking for his third win in the race. He previously rode Miss Matched (2005) and Hightop (2009) to Dogwood victories. Among the challengers to Figarella’s Queen is Sierra Farm’s homebred Everyonelovesjimmy (5-3-1-1—$107,530). The daughter of Jimmy Creed is pursuing her third-consecutive victory as she tries stakes company for the first time. Trained by Ian Wilkes with his son-in-law Chris Landeros named to ride, Everyonelovesjimmy broke her maiden in March by nine lengths at Gulfstream Park. 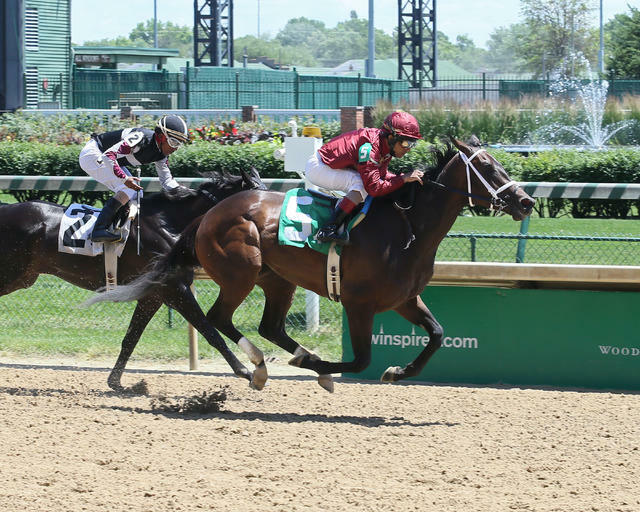 The bay filly won a first-level allowance race in June at Churchill by 2 ¼ lengths and, most recently, narrowly defeated a field of six as the heavy favorite in a conditioned-allowance race at Ellis Park on Aug. 11. Everyonelovesjimmy will break from post position seven. Also in the Dogwood field is Arlington Park-invader Jean Elizabeth, who is on the hunt for her seventh-career victory in nine starts. The speedy Illinois-bred daughter of Adios Charlie, owned by V-Leaf Stables, Richard Ravin and trainer Larry Rivelli, recently won a 6 ½-furlong state-bred allowance race by a comfortable 5 ¼ lengths over the Polytrack surface at Arlington Park. Jean Elizabeth (8-6-2-0—$166,222) will be ridden by James Graham from post four. Other rivals in the Dogwood include Jersey Girl Stakes runner-up Devine Mischief for trainer Joe Sharp; recent Saratoga allowance winner Miss Mimosa for trainer Bill Mott; and Texas Stallion Stakes winner Shes Our Fastest for trainer Scott Gelner. The field for the Dogwood, in order of post position (with jockey and trainer): Figarella’s Queen (Bridgmohan, Cox); Divine Queen (Calvin Borel, Buff Bradley); Shes Our Fastest (Jack Gilligan, Gelner); Jean Elizabeth (Graham, Rivelli); Miss Mimosa (Ricardo Santana Jr., Mott); Devine Mischief (Adam Beschizza, Sharp); Everyonelovesjimmy (Landeros, Wilkes); Salt Bae (Julien Leparoux, Bernie Flint); Primo Extremo (Walter De La Cruz, Jason DaCosta); Naples Legacy (Gabriel Saez, Mike Maker) and Go Google Yourself (Brian Hernandez Jr., Paul McGee).